There have been hints dropped that they would like to add more of a Strategic element to this game. What “Strategic” implies in this game I’ve not seen any clues to what that might mean. I thought I would lay out my own ideas. To me, a strategic element implies an impact on play for achieving (or not) specific objectives and logistical constraints (aka the need to maintain supply lines). Real life examples can be shown in WWII. The Allies strategic goal was to defeat the AXIS powers in Europe. To achieve that strategic objective they came up with a Grand Tactical goal to have base of operations somewhere (anywhere) in Europe. That Grand Tactical Goal was subsequently supported by a tactical operation…. D-Day. There were subsequently even smaller tactical ops like Rangers Scale Pointe de Hoc that supported the tactical operation D-Day. 1) Divide the map into Zones. 2) Require that the map be “controlled” or “conquered” by zone. With the following “rules”. a. Zone 1: Sectors are protected systems that opposite faction players cannot navigate into. Provide a “explanation” to players that the fleet is able to effectively fly a CAP that keeps the most (the player controlled) Cylons out of the systems. The OPs would build and withdraw using the existing “player activity’ mechanics. b. Zone 2: OPs cannot be built unless all Zone 1 OPs are up. If any OPs are missing in Zone 1, OP progress is reported as N/A in Zone 2. Once all OPs are up, OP progresses as current game mechanics. If a OP in Zone 1 withdraws all progress percentages on OPs for Zone 2 freeze at the current value until all OPs are restored to Zone 1. All Zone 2 sectors gain Protected System status if all OPs in Zone 4 are up. · If an OP in Zone 2 withdraws, OP progress freezes at current levels. · If an OP in Zone 3 withdraws, OP progress freezes at current levels. · If an OP in Zone 4 withdraws, OP progress freezes at current levels. · If an OP in Zone 5 withdraws, OP progress freezes at current levels. · If an OP in Zone 6 withdraws, OP progress freezes at current levels. · If an OP in Zone 7 withdraws, OP progress freezes at current levels. Duel OPs are possible in the same way that they are in the game today. The Secret Bases are still "secret" and cannot be navigated to by opposite faction players. In this way players would easily understand that if they get together and get that last OP up in Zone 5 Then mining speed will jump. Right now, nobody thinks about the reasons you build a new OP, plant mines beyond you own needs, or destroy enemy Ops , we do it “just because” not for how it influences Sector Control. In my opinion, if we keep it simple, people will play to influence the Sector Control and not just to meet there own needs as a player. It doesn’t leap out at you when you look at the zone map, but here’s what it boils down to as far as Strategic Constraints. Both factions can build out to Zone 4 and not be in conflict with each other. 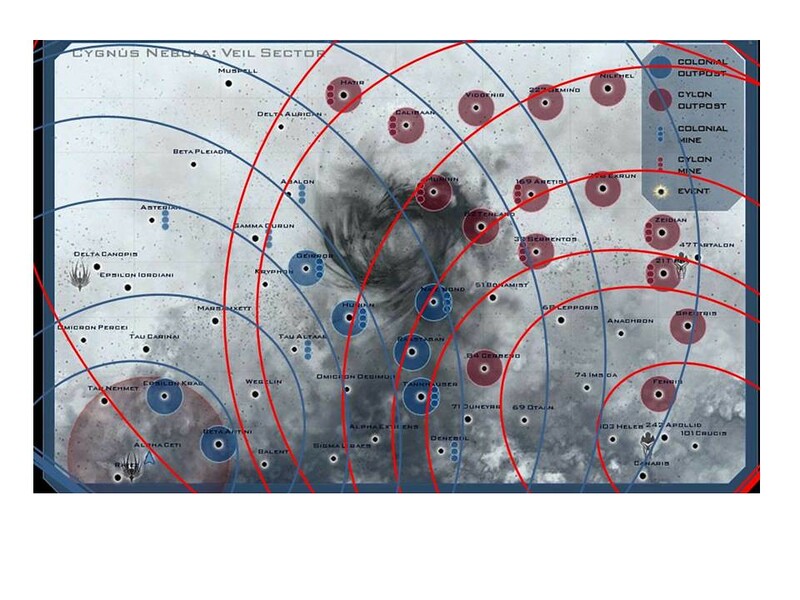 However, once one faction expands to having all OPs up in Zone 5 (and they are no Duel OPs), that means that the other side does not have all its OPs in Zone 4. To speak to it from a Colonial point of view, if the Cylons have successfully expanded to Zone 5 that means that Colonials do not have OPs in Omicron Decimus or Alpha Extingens in their Zone 4. To stop further Cylon expansion and begin Colonial expansion, those two systems could become battleground hot beds under this model due to the “strategic elements”. a) I think one of the biggest problems with this kind of strategic structure would occur on a very unbalanced server. The dominant faction could build themselves out to Zone 8 and lock the enemy out from Zone 2-6. That said, the underdog faction could find pride and challenge in surgical strikes. A fun operation would be to take out a OP in Zone 7 and follow up with a surgical strike on one of the Zone 5 OP, and then followed up immediately by another surgical strike on a Zone 3 OP. If organized and strong enough hit Zone 2. The dominant faction would have huge demands trying to defend those backfield OPs against a smaller force with lots of possible targets to select. The underdog side would send a clear and strong message. An operation like that would knock the dominant faction back for a 3-4 hour game span as they would need to rebuild in Zone order. The outlying Zones would sit in Outpost N/A status as the hour countdown clock and re-build times for the lower zones would need to complete before dominance could be re-asserted. b) There’s probably a hefty portion of the player population that has no interest in the strategic side of the game. It’s a first person shooter after all. They have no interest in winning or losing a war, they want to win and lose fights, not battles. There is no interest that the results of one fight could have an impact on the next fight to many participants in this game. You see some of this already with the scant strategic content currently available. Players who want to organize armies versus players who want to be left alone to fight the good fight getting into conflict about each other’s style of play. This post got allot bigger than I thought it would when I started writing. Please read the above as suggestion and guidelines for adding Strategic Elements to game play. I think these kind of elements would accomplish a number of things. Game play would have more of a purpose. Outposts would have meaning in play. Defense would matter. Amongst others. Nice theroy, maybe you should so div commanders and maybe get the map finalised and put into action..
you will also need to give every in the div a copy.